Dental care doesn't just look after the part of the tooth you can see. The gums, bone and root structure of the teeth all play an important part in your oral health. Radiographs or x-rays are not only required to detect decay and infection, but to also check the health of these structures hidden below the gum line. Traditional x-rays or radiographs expose you and our team to radiation, they are time consuming, require chemicals to process and are not very computer compatible. At Anzac Avenue Dental, we use only digital x-ray. The dose of radiation you receive is up to 90% less than with a conventional x-ray, it takes only a couple of seconds for the image to reach the computer and it requires no chemicals. Digital x-rays use a very small sensor that is held over your tooth, and transfers the image to the computer. 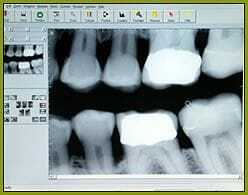 Your dentist can then manipulate the images for better diagnosis and can store the x-rays on file for later treatment. While the cost to you is actually less because it is a quicker process, digital x-rays require very expensive equipment, and many dentists do not offer this service as a result. At Anzac Avenue Dental, we believe that the benefits far out way the cost and we are proud to be able to offer you this state of the art technology. Click here to read our education brochure which discusses the importance of dental radiographs and the things you can do to reduce your risk of oral cancer.